Ben, a Twitter friend, suggested I make this seven-yolk pasta, and since I hadn’t made homemade pasta in ages, this recipe totally piqued my interest. I tweaked the recipe a bit by replacing some of the all-purpose flour with semolina flour to create a better texture and colour in the pasta. If you’ve never made pasta at home, it’s not as intimidating as it seems. 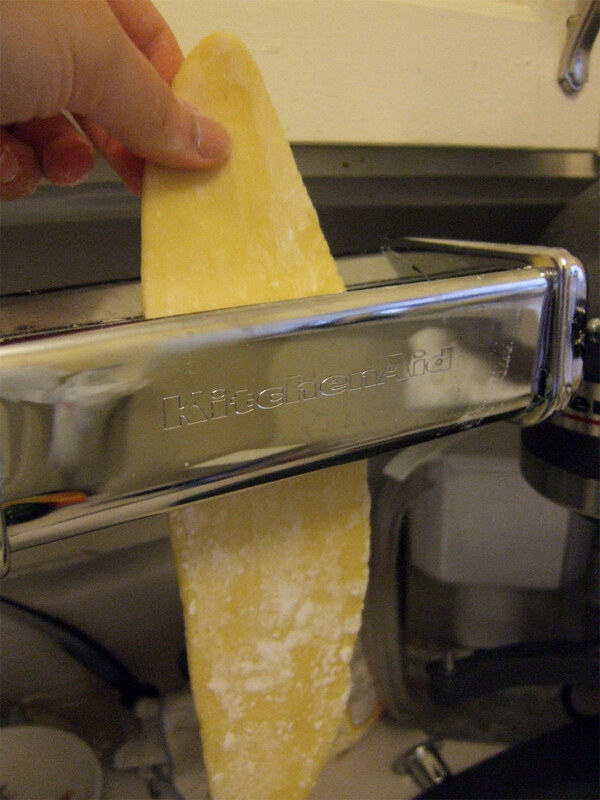 Once you have a pasta-maker, whether it’s the hand-crank version or a mixer attachment, you’re good to go. Be patient with the dough though. Kneading the dough is crucial is ensuring you get perfect pasta. Pasta should be air-dried for at least 10 minutes. You can use hangers to you’re your pasta from, or twirl them into a bunch, making sure you flour the pasta generous beforehand to ensure the strands don’t stick together. 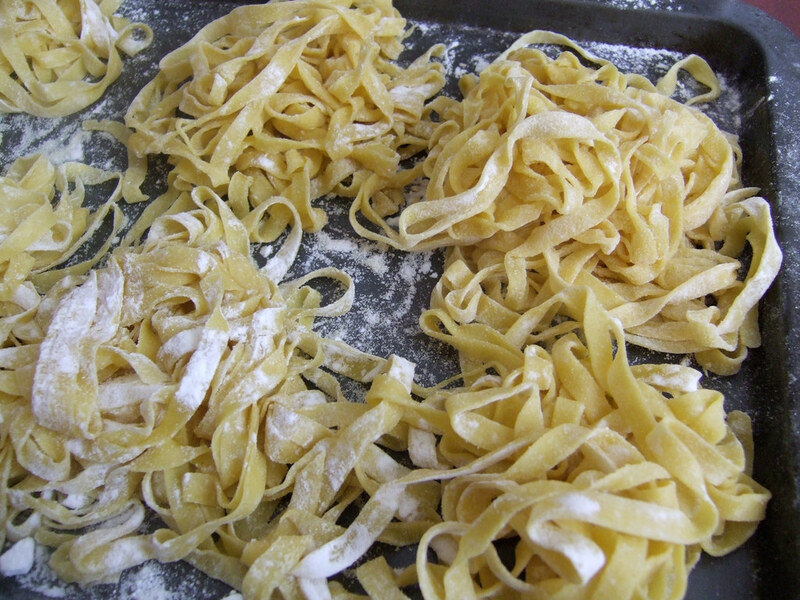 Fresh pasta takes much less time to cook, about 3 to 4 minutes. Toss with your favourite sauce and enjoy! Mound flour, semolina and salt on a board or other surface and create a well in the center, pushing the flour to all sides to make a ring with sides about 1-inch wide. Make sure that the well is wide enough to hold all the eggs without spilling. Pour the egg yolks, egg, oil and milk into the well. Use your fingers to break the eggs up. Still using your fingers, begin turning the eggs in a circular motion, keeping them within the well and not allowing them to spill over the sides. This circular motion allows the eggs to gradually pull in flour from the sides of the well; it is important that the flour not be incorporated too rapidly, or dough will be lumpy. Keep moving the eggs while slowly incorporating the flour. 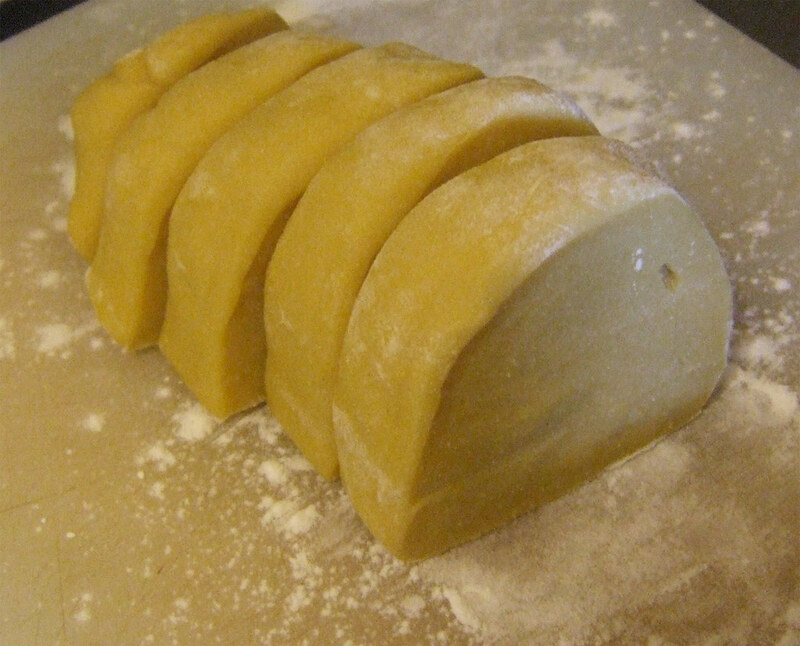 Using a pastry scraper, occasionally push the flour toward the eggs; the flour should be moved only enough to maintain the gradual incorporation of the flour, and the eggs should continue to be contained within the well. The mixture will thicken and eventually get too tight to keep turning with your fingers. Dust the clean work surface with a little flour. Knead the dough by pushing against it in a forward motion with the heels of your hands. Form the dough into a ball again and knead it again. Keep kneading in this forward motion until the dough becomes silky smooth. The dough is ready when you can pull your finger through it and the dough wants to snap back into place. The kneading process can take from 10 to 15 minutes. Even if you think you are finished kneading, knead it for an extra 10 minutes; you cannot overknead this dough. It is important to work the dough long enough to pass the pull test; otherwise, when it rests, it will collapse. The Food Junkie June 18, 2010 at 9:47 a.m.
Mardi @eatlivetravelwrite June 20, 2010 at 10:39 a.m.
Oh my goodness gracious - how decadently delicious!!! 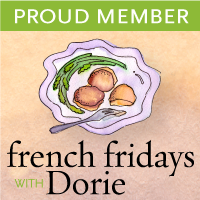 And I think you used the eggs from Stratford, right? 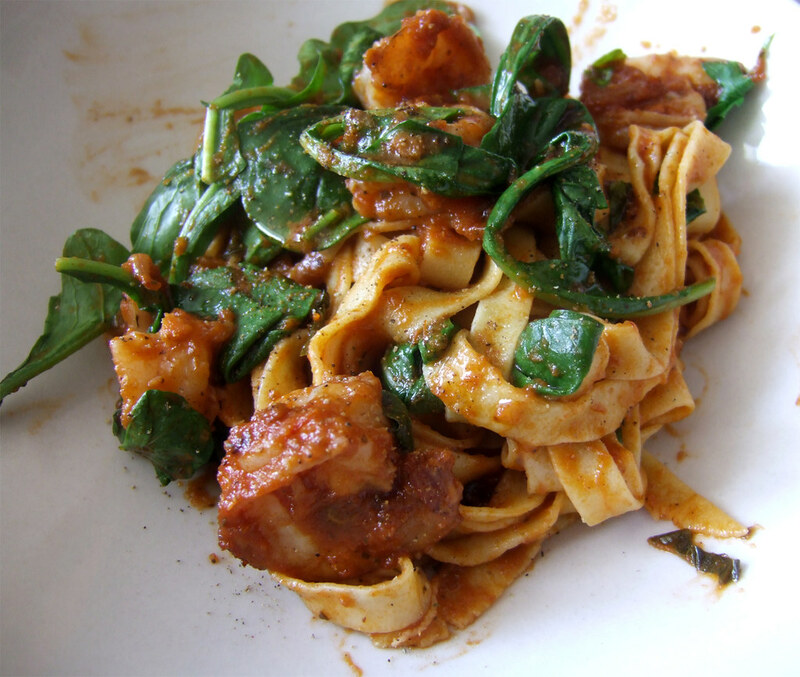 Your pasta is absolutely gorgeous - love the colour from the semolina! Tonya @ What's On My Plate June 20, 2010 at 11:11 a.m.
Suzanne Ellis August 14, 2011 at 3:05 p.m.
Definitely going to try this....looks delicious! !